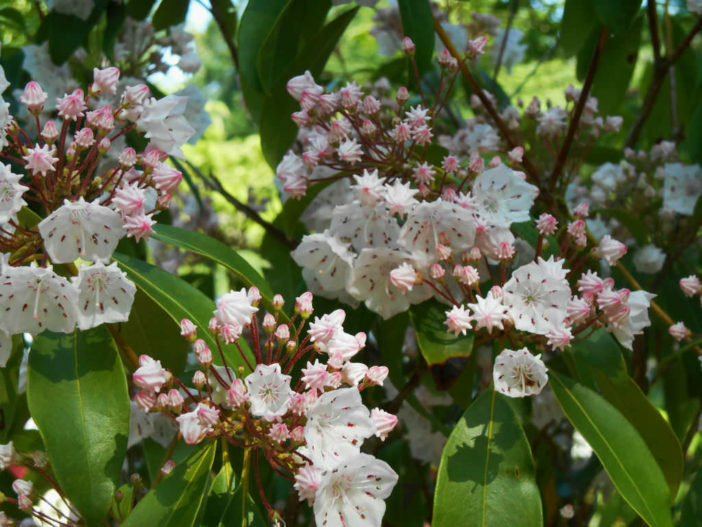 Mountain Laurel (Kalmia latifolia) is a broad leaf evergreen that grows and flowers well in full sun to part shade, making it a versatile shrub in the landscape. The broad, dark green leaves provide interest all year long. In spring clusters of cup-shaped flowers open in shade of white, pink and red. It’s a favorite of bees and butterflies. The shrub grows naturally in the filtered light under tall deciduous trees such as oak and maple, especially near a wet, swampy area. It flowers best, though, with more sun in an open landscape, but the leaves may turn a yellow-green color in full sun. Start seeds indoors in spring at 43 to 54 °F (6 to 12 °C). Take greenwood cuttings in late spring or semi-ripe cuttings in mid-summer. Layer in late summer. Mountain Laurel will get spindly, develop leaf spots and have few flowers if grown in too much shade. Look for leaf spot resistant varieties if growing under these conditions. It also doesn’t grow well in poorly drained soils. It’s a slow grower that should only be pruned to shape the plant in spring after flowering. Dead, diseased and broken branches can be taken out at any time. Mountain laurel doesn’t have many pest problems.